At FastMed, we believe in happy, healthy kids, and baseball has kept young boys and girls active during the summer months for a very long time. The high socks and broken-in leather gloves, the snap of a ball hitting a bat — it’s all as American as fireworks on the Fourth. You can almost hear a vendor yell, “Hot dogs!” as a player kicks up dust and rounds third for home. So as the kids gear up to take on the diamond, what are some things you can do to ensure a safe, fun ballpark experience? Before a child plays any sport, it’s important to schedule a sports physical. A physical is one of the best ways to identify health issues before they lead to more serious injuries. Be sure to tell the doctor about your family’s medical history and any existing issues, so he or she can accurately evaluate and clear your child for activity. Schedule your next sports physical at FastMed and begin the season with some peace of mind. Leave the peanuts and Cracker Jacks for the spectators. Before your child steps out onto the field, make sure they’ve eaten ample protein, carbohydrates and vitamins. Check out some fun, healthy recipes if you need help getting the right foods past a picky palate. Keep in mind that while the average kid eats anywhere from 1,600 to 2,200 calories each day, an athlete may need more food to fuel his or her performance. Keep healthy snacks in the pantry in case your slugger comes home hungry after a practice or game. Keeping children safe in the summer can take some planning. You want to be sure they wear the right clothing, drink plenty of fluids, and take regular breaks if they are exposed to extended sunlight. Sunscreen is also important to prevent sunburn, and be sure to read labels on your child’s medications, as some medicines can cause reactions in the heat. Preventing heat-related illness is a major priority when kids are playing outdoor sports, and it wouldn’t be baseball without a blue sky and freshly cut grass. At FastMed, we are committed to smart hydration. Through our “Keep Cooler Program,” we donate five-gallon water coolers to local schools, athletic departments, sports associations and non-profit organizations. Most common in children between ages 8 and 15, Little League elbow is an overuse injury related to throwing. It is most common in pitchers, but can affect anyone on the field who puts pressure on their arm. For young athletes whose bodies are still growing, stressing the elbow before the growth plate is fully developed can cause aches, pains and/or swelling. If the growth plate is stressed, small fractures can form. An X-ray at FastMed Urgent Care will show if your child has Little League elbow and, often, recovery is a matter of getting adequate rest or physical therapy. Help your child avoid overuse injuries by promoting rest, ensuring smart training and preparation, and by teaching how to throw correctly. Good mechanics prevent a lot of injuries. 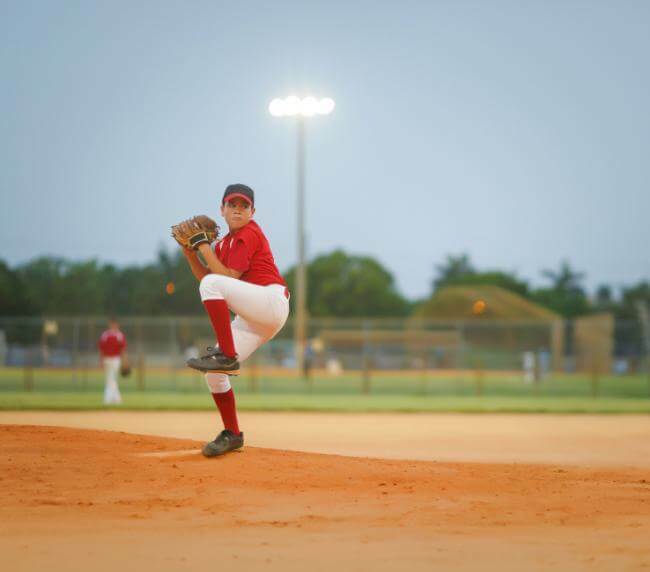 For more information on scheduling practices, the University of Pittsburgh Medical Center recommends using the Little League Baseball throwing and resting guidelines for young pitchers. FastMed is always available if you have questions about sports related injuries or if you want to schedule a sports physical. With locations across Arizona and North Carolina, you can visit a clinic near you any time your Little Leaguer needs help getting back on the field. Our online check-in makes seeing a doctor fast and easy — so much so, you can probably squeeze in a visit before the second half of a double header.